What adventures!!! It's all great but you had me at those donuts. Wow....they look so yummy. Rachel's kitty is so pretty!! Glad you had a good Spring break, but sorry about your foot - ouch! 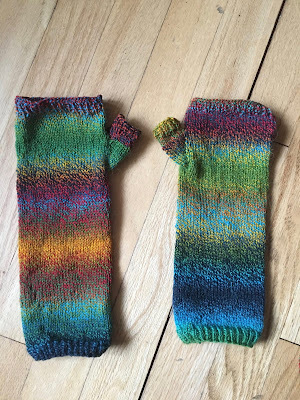 Love your fingerless mitts and seeing them reminds me that I want to knit up some as gifts for next winter. Good to hear from you again. Delilah is a beauty! Sorry to hear about your foot but happy that you were able to attend the birthday celebration and connect with family. I agree that the Zauberball Crazy yarn is fun to knit. So nice to hear what you have been up to recently! The sore foot doesn't sound like much fun or the paperwork but the traveling and family is five stars! The mitts are amazing! Ooh, that sounds fun! I'd really like to visit Seattle -- it's on my list! Zauberball yarn is really fun -- I have two skeins in my stash that I'm looking forward to knitting up. Hope your foot is back at 100% soon. Wow That's a lot of air time. Love the mitts. Actually, I love just about anything knit with a Zauberball. Hope your toes feel better soon. At one point we had two cats with totally opposite personalities. T was super cautious and would 'test' something about 3 time to see if it would hold her weight before actually getting on it. Gus was ADHD. The first day we had him, he started across the floor for one thing, saw another changed course to head for it, saw something else and changed course again, I don't remember if he ever made it to any one object he was interested in. Man - what a busy time for you. So glad you were able to spend time with your family. Ha! I love that Special Ed teacher comment. I made a few of those myself - back in the day. Lots of adventures and a sore foot! Hope you're feeling better now. It sounds like it was a pretty painful experience. Nice that you had that vacation to enjoy visiting family. lovely fingerless mitts. I like that cat with special attention deficit. :) . I hurt my foot last year at work and still can't wear shoes that lace up, good thing I live in Florida. Your trips sound wonderful, a perfect spring break. Sounds like you had a wild and crazy adventure! Hope you hit Seattle during the span of great weather in March. Next time you come sure hope you'll call! (Sure glad you didn't come for the Feb. snow, the first real snow in absolutely ages! We were housebound for a whole week.) Hope your foot heals quickly! What a fabulous break! I'm sorry about your foot, hopefully it will be better soon. 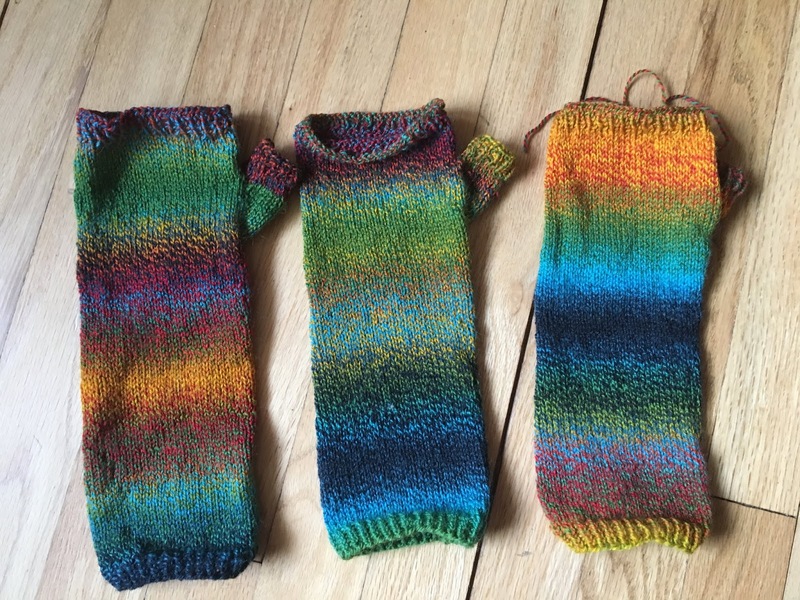 I love your mitts and I love self striping for that reason too - you can't put it down for wanting to get to the next colour.